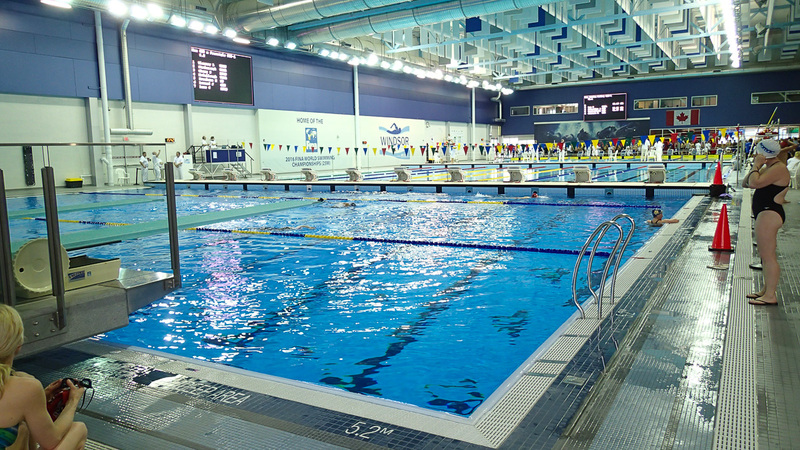 Short loosen-up swim at the Windsor International Aquatic Center on Day 1 of the Masters Swimming Ontario Provincial Championships. 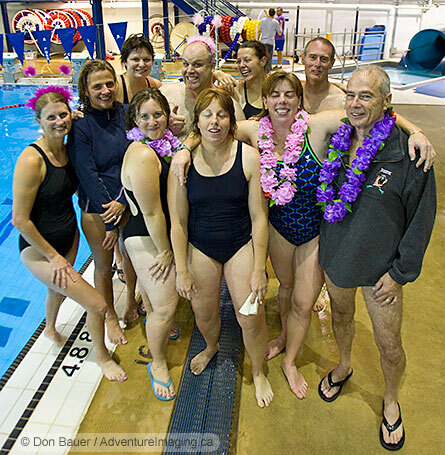 Hosted by the Nepean Masters Swim Club at the Nepean Sportsplex. 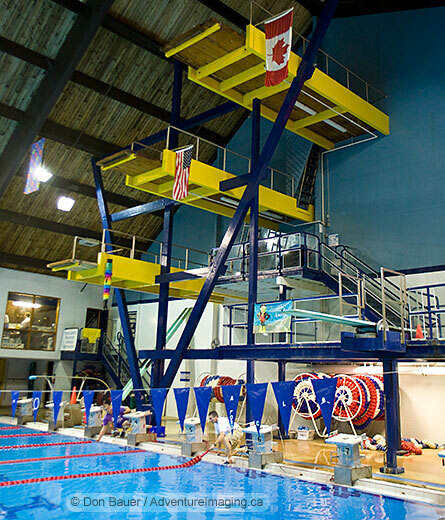 Practice cancelled due to CFB Borden Pool Closure. The pool is re-opening later today – Friday practice will go as normal. Practice CANCELLED due to a mechanical issue at the pool. 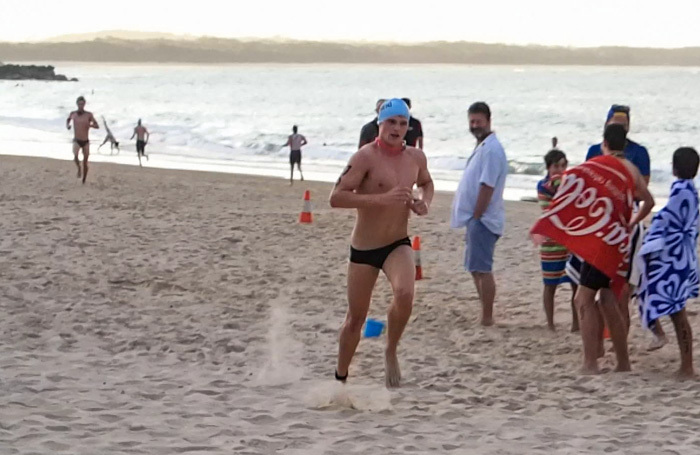 Gold Coast’s George O’Brien scored a surprise win over swim king Ky Hurst at the Eyeline 1000 Noosa Ocean Swim today, while Melissa Gorman re-claimed her title in the famous annual event. The race, which regularly attracts the biggest names in the sport, will be one to remember for George, who rated the win as one of the best in his career to date. “I have never beat Ky in a race like this so it’s a good feeling,” O’Brien said. O’Brien established a clear lead early in the race, leading the tight male pack at the half way mark ahead of Ridge & Codie Grimsey. He continued to extend his lead in the second half of the race to finish ahead of Sam Sheppard of Ringwood VIC and Codie Grimsey of Cashmere who finished second and third respectively. O’Brien, who trains under Dennis Cotteral in Miami, won bronze in the 10km Australian 2010 Open Water Swimming Championships to gain selection into the pan-pacific team. “I didn’t have the best start but picked up pretty quickly. It was then good to be in front because you can keep an eye on the guys behind,” O’Brien said. Australian long distance swimmer, Melissa Gorman, was fierce competition in the female field. Gorman, who won the event in 2009 dominated the womens field taking the lead early and maintaining a steady stroke to finish ahead of the Sunshine Coast Sarah Kime and 2010 champion Danielle Defrancesco. Gorman will now focus her efforts on competing for Australia at the 2012 London Olympics. “Having being already selected for the Olympics it’s a really good feeling. 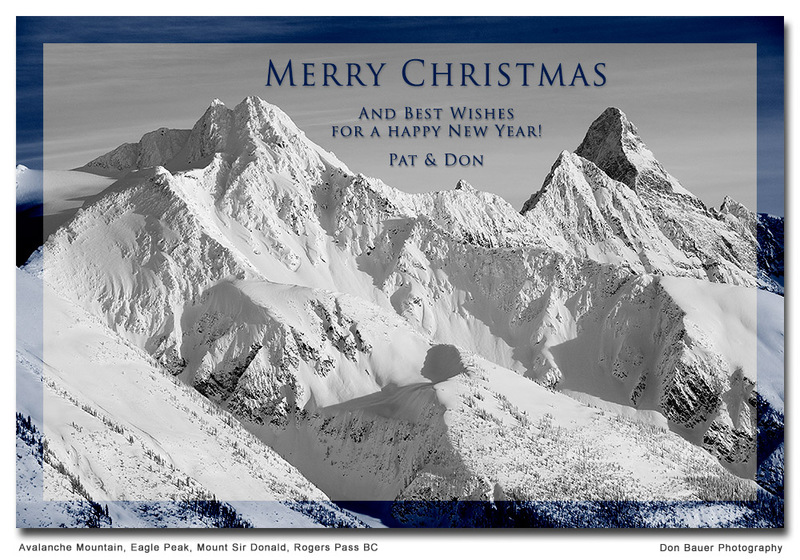 I am really looking forward to next year. I am going to head over to New Zealand to compete in a few events like this one as the waters are a bit colder over there however it’s still close to home. “Depending on my training schedule I will see how many other events like these I can do around the country but obviously I can’t miss too many as it starts to even out,” Gorman said. Ky Hurst, who held the title for 8 consecutive years placed 4th in the event. “I felt good, it was hard. There were a lot of great swimmers today. That’s what we want to see, good pool swimmers and good open water swimmers all at once, that’s why the pace was so quick. “I’ve been coming here for a very long time and I can always come back next year. Now I’ve got something to work towards. “We had perfect conditions, it was really flat and it suited every single person, we couldn’t have asked for anything more, and the calibre of swimmers here – it was just fantastic,” Hurst said. 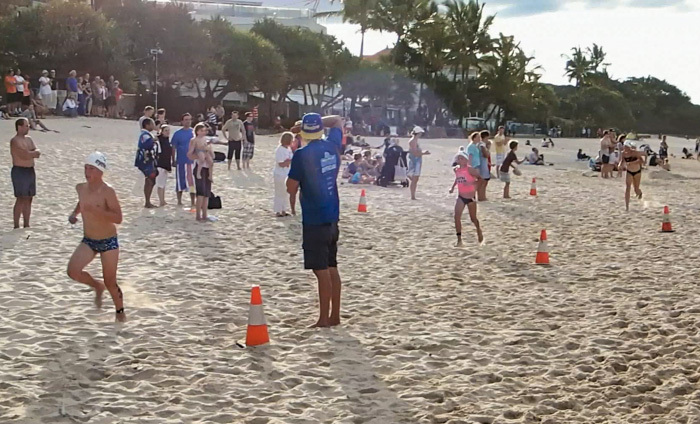 Ironman world champion, Chris McCormack, competed in the mates-wave of the event as a good hit out before racing in Sunday’s pinnacle event of the festival, the renowned Noosa Triathlon. “I think the girls beat us. We do these swim races all over the country so for us it’s a bit of fun. “I beat my mate by about 40 seconds so I can just gloat about that for the next year,” McCormack said. 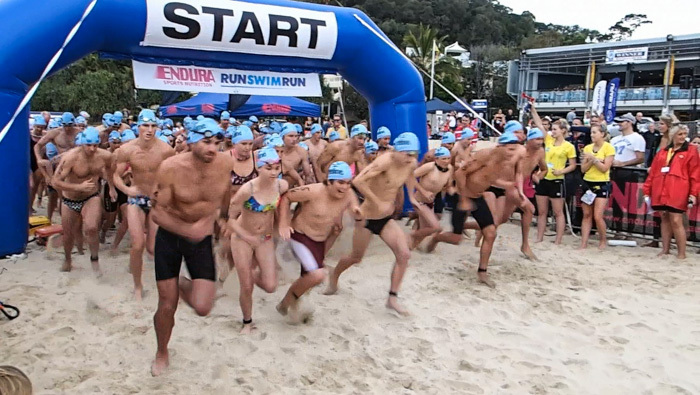 Prior to the elite component a massive field of just over 1200 competed in today’s ocean swim event. 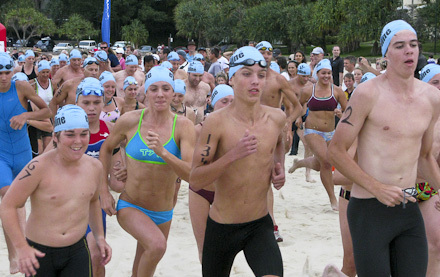 Tomorrow is Super Saturday at the Noosa Triathlon Multi Sport Festival 2011. 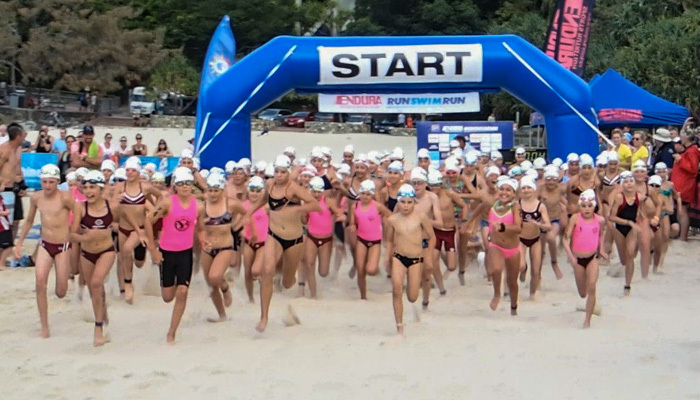 Some of the highlights of tomorrow’s program include The Courier Mail Noosa Superkidz triathlon, The Tingiarana The Legends Triathlon, the Subaru Noosa Cycling Grand Prix and the Asics Bolt. 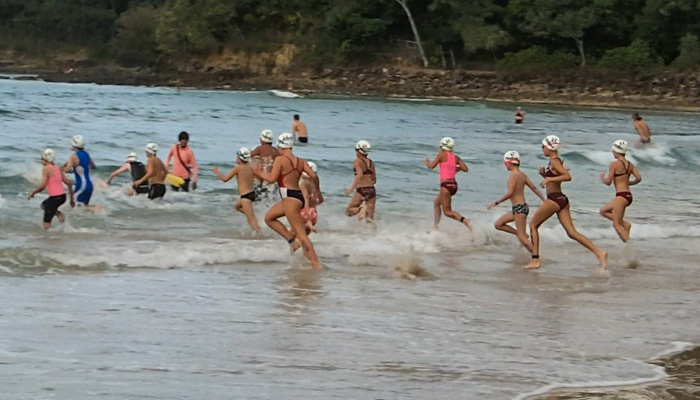 The highlight of the weekend is the Noosa Triathlon on Sunday, which has attracted over 8000 triathletes. 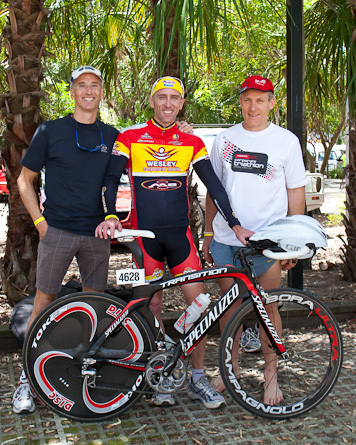 A full set of results will be posted on www.noosatri.com.au. 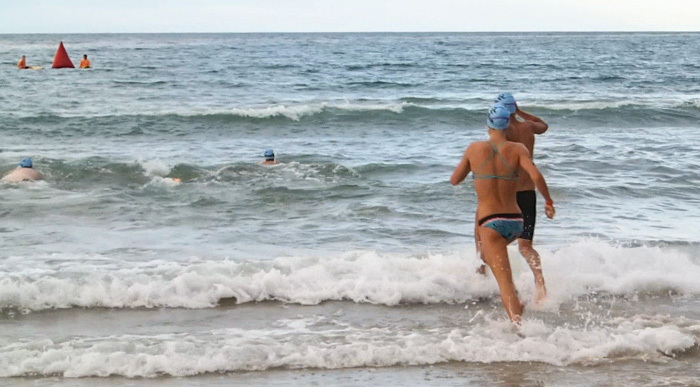 The Noosa Triathlon Multi Sport Festival is supported by the Queensland Government through Events Queensland as part of a record investment in major events supporting regions all over Queensland, including the Sunshine Coast. 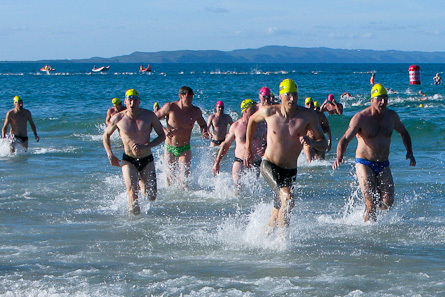 Noosa Main Beach – 3pm – North end out to the 750m Run-Swim-Run course, swam the course and back to the North end. 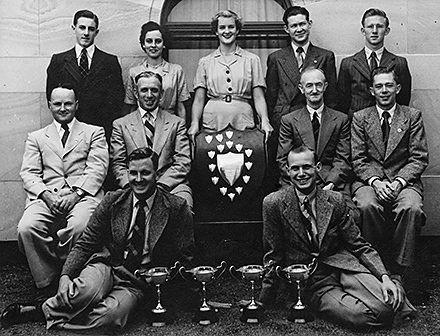 Second from the right in the middle row is my Grandfather John (‘Jack’) Crawford, aged 50 at the time of the relay/photo. A.M.P. is the “Australian Mutual Provident Society” and the relays would have taken place in Brisbane. I’ve had the cup since my Grandfather gave it to me during my first visit Down Under in 1969. Some of the ‘youngsters’ in the photo would still be alive today … perhaps still swimming as Masters! Full meet results and videos are posted on the BEAST News page. It was Leslie’s first meet and she sure jumped in big, swimming the 50m, 100m, 200m and 400m Freestyle individual events plus both the 4 x 50m Free and Medley relays. For Pat, it was her second meet and she progressed to using the blocks … coming home with a 2nd place finish in the 200m Free and 3rd in the 50m Breaststroke! Veteran’s Gen and Cat swum well … Cat placed 2nd in the 100m Fly and Gen 3rd in 50m Backstroke. The Semi-Serious competition took place mid-way through the meet during the Official’s break. 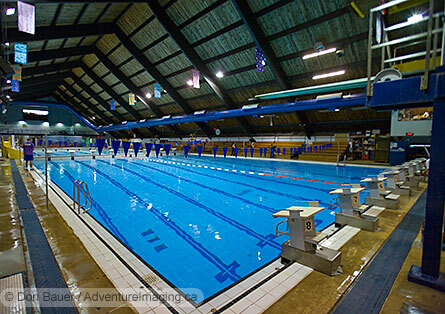 Fourteen team teams had been randomly generated by EOMAC with around six swimmers each. Teams were a mix of men and women from various clubs. 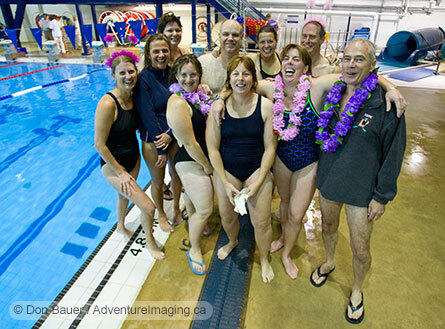 The fun relay events ranged from swimming with continuous contact to a kickboard and pull buoy to a six swimmer train. The team I was on ended up tied for first place after about four events. 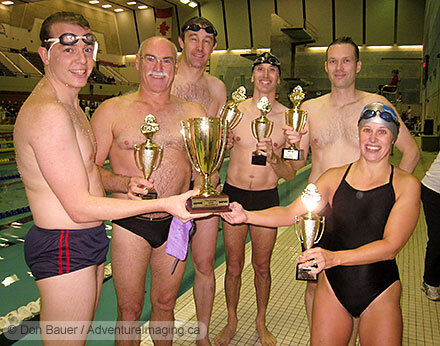 One more relay would decide the 2008 “Not Serious” Championship … a six pool width relay. We came out victorious (by almost a width), but as you can see from the Championship photo, it might not have been a fair race … our team was stacked with GIANTS!! Many thanks to Etobicoke for putting on such a fantastic meet! Congrats to all that participated. Of special note – Ian raced in 6 events and place first in all of them! And Sarah … she swam in all 10 events, finishing with 4 Firsts, 1 Second and 5 Thirds … all podium finishes!! 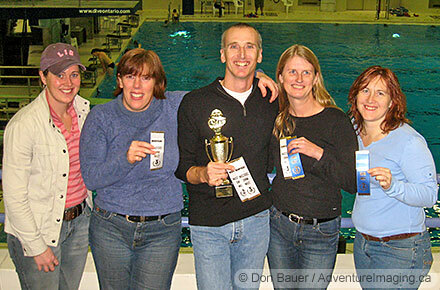 Of the first-timers … Susan placed 1st in 50 Back! Bruce made the podium (3rd) in 25m Back. Dave managed three 3rd place finishes (50m Back, 25m Back and 25m Breast). Annic finished 2nd in 200m Free. Judy pulled of a 2nd in 50m Back and a 3rd in 100m Free. And Pat dropped 7 seconds off her estimated 50m Freestyle along with finishing 4th in the 25m Breast. 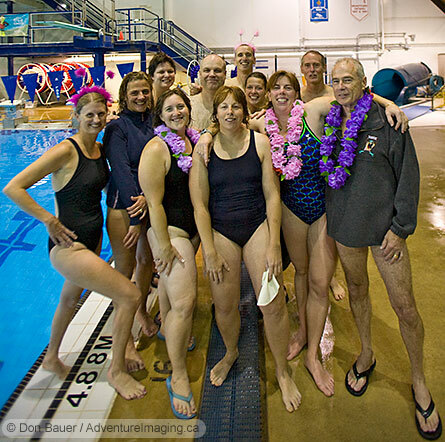 Veteran swimmers Gen and Cat provided plenty of on deck encouragement and Cow Bell ringing … along with some great swims. Videos of some of the BEAST swimmers racing at Brantford can be viewed on the BEAST web site News Page. See more photos below. Bruce definitely looks best in the pink antennas! Now, who had fun at the Brantford Meet? Details to follow once the results are published. Video to come too! 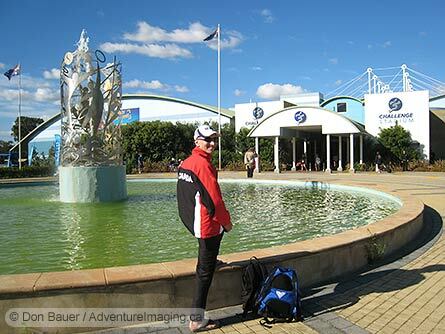 Finally … a few mintues of interent cafe time to post a bit of news from the World Masters Swimming Championships, taking place in Perth West Australia. The 100m Freestyle was my first race of the meet and I was seeded 3rd in heat 39 of 74. Yes, Men’s 100 FS is certainly popular with approximately 710 entries. Only the Men’s 50 FS event has more swimmers (824). Another Canadian Martial Rivard (CAMO) was in lane 5 beside me and Ralph Rieper (TOMS – North York Gators) was in heat 40. Martial had the fastest seed time in heat 39 followed by Dr. Varga from Hungary (lane 6). Unfortunately the heat sheets do not provide heat start times so it is a real guessing game as to when to warm-up and head to the marshalling area. As I’m only just starting to catch onto the concept of pacing, my game plan was to swim smart and paced. So with my coach Cathie’s voice playing in my head, I tried to be fast off the blocks and then ‘easy’ fast until close to the end of the first 50. Before the flags at the far end I was behind 4-5 of the other swimmers. At that point I picked things up to put in a fast turn and strong exit off the wall. By the time I passed the flags coming back I was in the lead. From there I just tried to continue accelerating until the lactic acid took over … then I just held on. I could sense Marital was close on my right so there was plenty of incentive to try to keep going. Alan Power (Westcoast-AUS) made a pretty good run at the end in lane 2. I finished the heat in first place in a time of 1:06.79 … a Long Course personal best. Ralph Rieper blitzed heat 40 in a time of 1:02 to take top Canadian in the 45-59 group, 28th overall. I placed 48th out of about 100. Full results are on the Championship Info page. A ‘Flash’ version of the race that my wife Pat shot can be see here – Men’s 100 FS Event Heat 39. You are currently browsing the archives for the 'News' category.